New York City is a great place to get married! I love working with out-of-town couples! I have a special place in my heart for tourists, as I was once a tourist myself before moving to the Big Apple. I can recommend places for the ceremony, including sites in city parks, locations with great views, intimate spaces, places embracing your special interests, or other wonderful spots around New York. 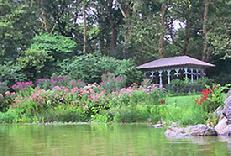 Central Park offers many beautiful locations for your ceremony. Popular spots include the Ladies Pavilion, Treehouse for Dreaming, Cop Cot, Shakespeare's Garden, Bow Bridge, Gapstow Bridge and the Conservatory Gardens. Some locations are quite popular so it's recommended that you reserve those through the Parks Department. The Central Park Conservancy is a good source for maps and photos of Central Park. You might also consider some of the beautiful bridges and arches in Central Park. Other noteworthy wedding locations include Battery Park, The New York Botanical Gardens, The Bronx Zoo, Rockefeller Center (including near the Christmas Tree), Bryant Park, Brooklyn Botanical Gardens, Times Square, the Brooklyn Heights Promenade and many, many more! Contact me so we can begin planning your NYC wedding! 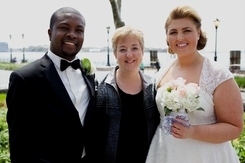 "Our most sincere thanks to Val for guiding us through the most important part of our wedding day! Thank you for your understanding and your thoughtfulness and filling our ceremony with what was important and special to us. Thank you for the beautiful way you helped us to include our daughter and our family and friends into our ceremony. It was a ceremony that was intimate, real, honest, spiritual, perfect!"